As you take your seat at Court Theatre – where the Chicago-based, internationally recognized Manual Cinema “performance collective” is now performing its astonishing, wildly imaginative version of Mary Shelley’s “Frankenstein” – you immediately sense that something completely out of the ordinary is about to unfold. The jam-packed but meticulously organized stage is outfitted with an elaborate percussion installation; a spinet piano, toy piano, marimba and other instruments; multiple projection screens; a window-like puppet stage; several work tables and bare-bulb work lights; microphones; a maze of cables and electrical cords; and performers dressed in pared-down versions of early 19th century clothing. And indeed, what follows is an elaborately layered and wholly hypnotic form of storytelling – at once handmade and high-tech, and mind-boggling in the complexity of the countless clockwork cues so essential to making it all spring to life in a seamless mix of live performance, silent film-style “intertitles,” many ingenious forms of puppetry, a haunting soundscape and more. Of course supporting all this is a similarly densely layered story about how Shelley came to write “Frankenstein,” the novel now being widely celebrated on the 200th anniversary of its publication, with three other major productions of the story staged in this city alone. To be sure, the death, a couple of years earlier, of her own baby (fathered by her lover, and later husband, the great Romantic poet, Percy Bysshe Shelley), had a major influence on Mary Shelley’s desire to imagine the efforts of a mad young scientist, Victor Frankenstein, to create a humanoid. But the more immediate impetus was a stay in Geneva, Switzerland, during which she, her lover, and his friend and fellow poet, Lord Byron, devised a competition to see who could write the best ghost story. That scene, it should be noted, is wittily played so that we see the two men’s typically dismissive sexism, and then watch as Mary heads off to her room to pen her enduring classic. And far more than a ghost story or horror tale, it is a profound psychological and social cautionary tale that deals with human arrogance, and the impulse for procreation as well as scientific exploration and artistic creation. On top of all this are the story’s strongly prescient contemporary echoes as genetic engineering, robotics and artificial intelligence continue to grow ever more sophisticated and (frequently) problematic. The creative forces at Manual Cinema are clearly master collaborators whose beautiful, magically evocative theatrical “creation” has been conceived by Drew Dir, devised by Dir, Sarah Fornace and Julia VanArsdale Miller, and laced with remarkable original music and sound by Kyle Vegter and Ben Kauffman. Applause, too, for the puppet design by Lizi Breit and Dir, the projections and scenic design of Davonte Johnson, Mieka van der Ploeg’s costumes, Claire Chrzan’s lighting, and the logistical nightmare of it all overseen by stage managers Erin Albrecht and Shelby Glasgow, who clearly must engage in a monumental act of synchronization. As for the five performer/puppeteers and four onstage musicians, they make you believe they are quite oblivious to all this intensely demanding synchronization as they convincingly and shrewdly portray multiple characters. The petite, wide-eyed, wonderfully animated Fornace plays both Victor Frankenstein and his creator, Mary Shelley. VanArsdale Miller appears as the heavily cloaked Creature, as well as Elizabeth, Victor’s adopted sister (and later, wife). Leah Casey sings beautifully and plays Victor’s mother, Caroline, as well as Percy Shelley, and Sara Sawicki and Myra Su assume other roles. The musicians – Zachary Good, Deidre Huckabay, Lia Kohl and Peter Ferry – are phenomenal. The miracle in all this is that the emotional power of the work never gets lost in the mind-bogglingly intricate clockwork mechanism that drives it. Quite a feat of creation on every front. “Frankenstein” runs through Dec. 2 at Court Theatre, 5535 S. Ellis Ave. For tickets ($50-$74) call (773) 753-4472 or visit www.CourtTheatre.org. Running time is 2 hours and 10 minutes with one intermission. 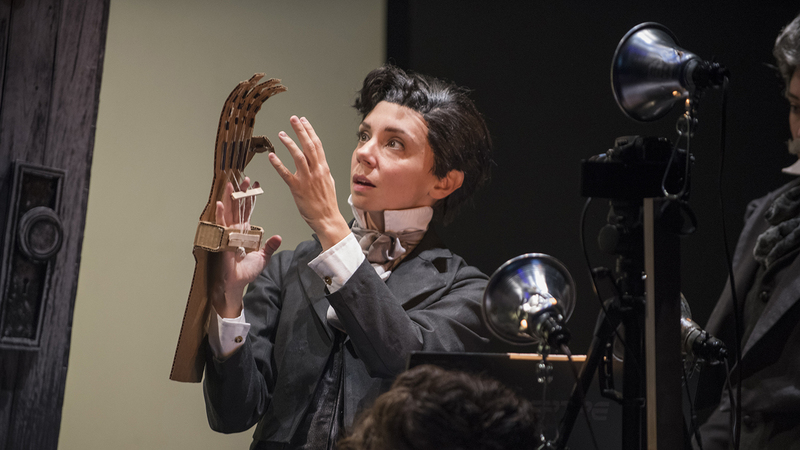 Note: While Lifeline Theatre’s “Frankenstein” production has already closed, Remy Bumppo Theatre Company’s runs through Nov. 17, and yet another version of the story is set to open at Lookingglass Theatre in May.